It’s so easy to get carried away pulling prints, but if you don’t art journal or collage, what can you do with them?? 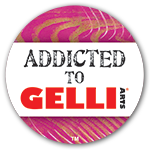 Here are some of my Gelli print projects. For most of them clicking the image will take you to the post and much more detail/more photos. Art Speak Gelliprint book. click the image to go to the finished project, and HERE to see how it began and HERE to get the Turtle Wrap cover instructions. I made this shelf card (instructions and Template in the link) from Gelli prints, and sent it off to the USA to an inspiring blogger. This Top Hat project uses a Gelli print pulled on a paper towel. This is a bank – like the next one, but simpler. It can also become a bank – this in not decorated with Gelli prints, but it could be! This ATC also shows printing and embossing on Washi tape! I improved the visibility of the hands here. 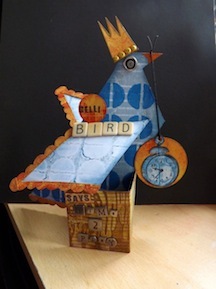 I made a paper bag book, covering the bags with 6×6 Gelli prints – click the image to see much more in the post! And this post has the construction of the book. I made a little foam-core frame and covered it with used and colourful paper tools! One of my favourites – my GelliBird! Another book – coptic bound, round pages. A coffee filter book, with the prints pulled right on the filters. Wow these are amazing ideas. Wow, great projects! I have been thinking about making a coffee filter book but you did it!